Download "Project Management Fundamentals with Microsoft Project"
1 Project Management Fundamentals with Microsoft Project Duration: 4 Days PDU Credits: 28 (Category A) This 4-day course is designed to provide practical, hands-on experience in the planning, development, analysis, communication, and reporting of projects. 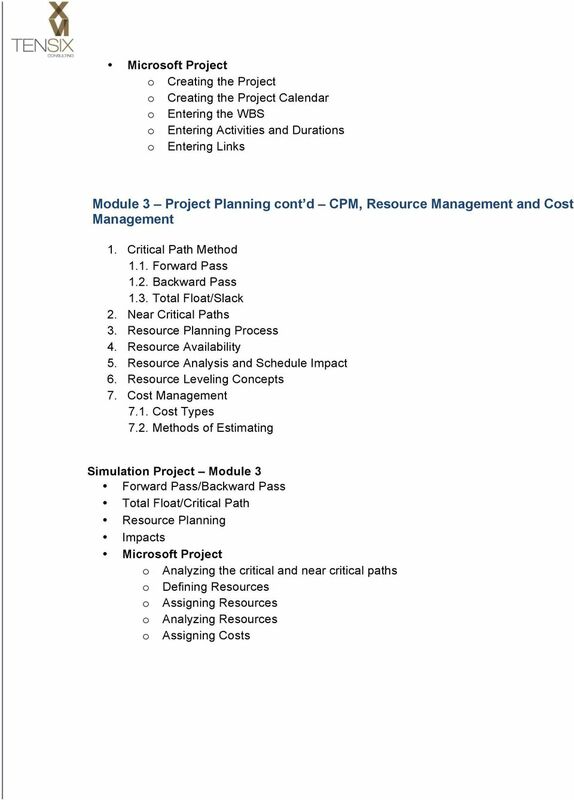 This course teaches project management processes, including project scheduling and control, and the implementation of those processes in Microsoft Project. 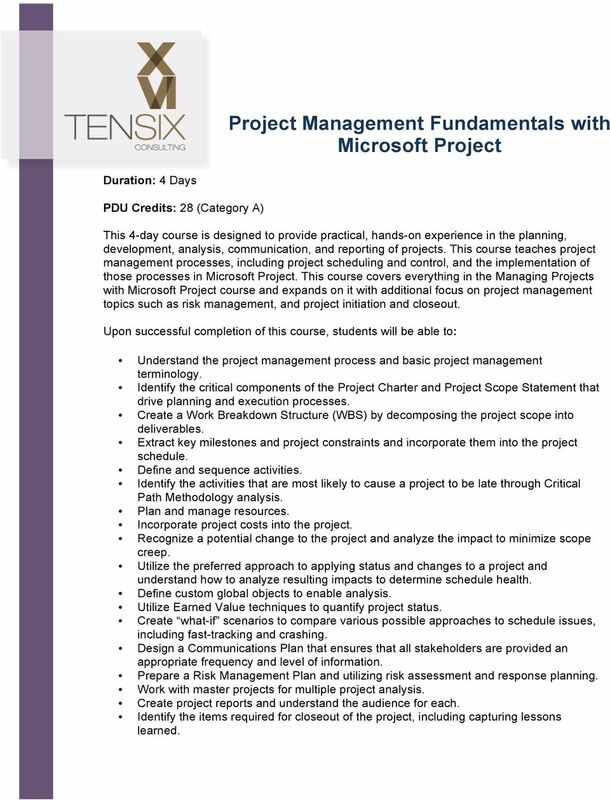 This course covers everything in the Managing Projects with Microsoft Project course and expands on it with additional focus on project management topics such as risk management, and project initiation and closeout. Upon successful completion of this course, students will be able to: Understand the project management process and basic project management terminology. Identify the critical components of the Project Charter and Project Scope Statement that drive planning and execution processes. 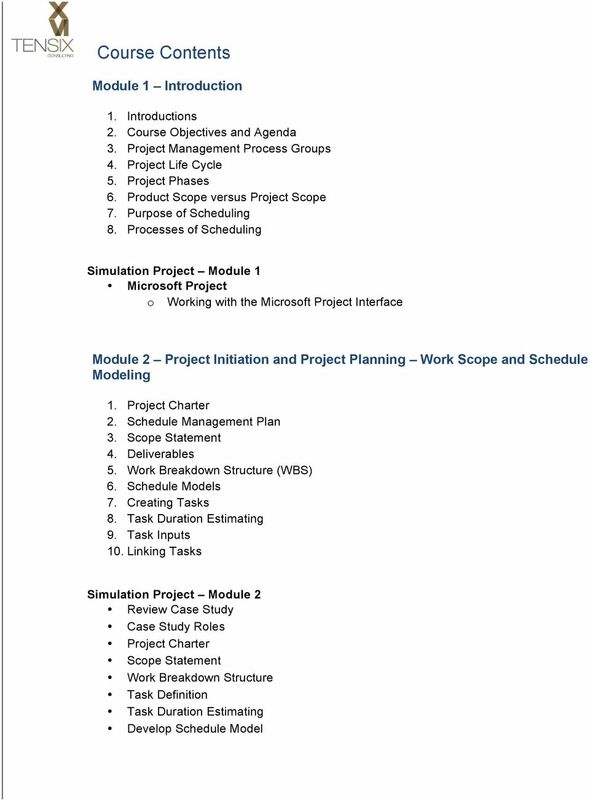 Create a Work Breakdown Structure (WBS) by decomposing the project scope into deliverables. Extract key milestones and project constraints and incorporate them into the project schedule. Define and sequence activities. Identify the activities that are most likely to cause a project to be late through Critical Path Methodology analysis. Plan and manage resources. Incorporate project costs into the project. Recognize a potential change to the project and analyze the impact to minimize scope creep. Utilize the preferred approach to applying status and changes to a project and understand how to analyze resulting impacts to determine schedule health. Define custom global objects to enable analysis. Utilize Earned Value techniques to quantify project status. Create what-if scenarios to compare various possible approaches to schedule issues, including fast-tracking and crashing. Design a Communications Plan that ensures that all stakeholders are provided an appropriate frequency and level of information. Prepare a Risk Management Plan and utilizing risk assessment and response planning. Work with master projects for multiple project analysis. 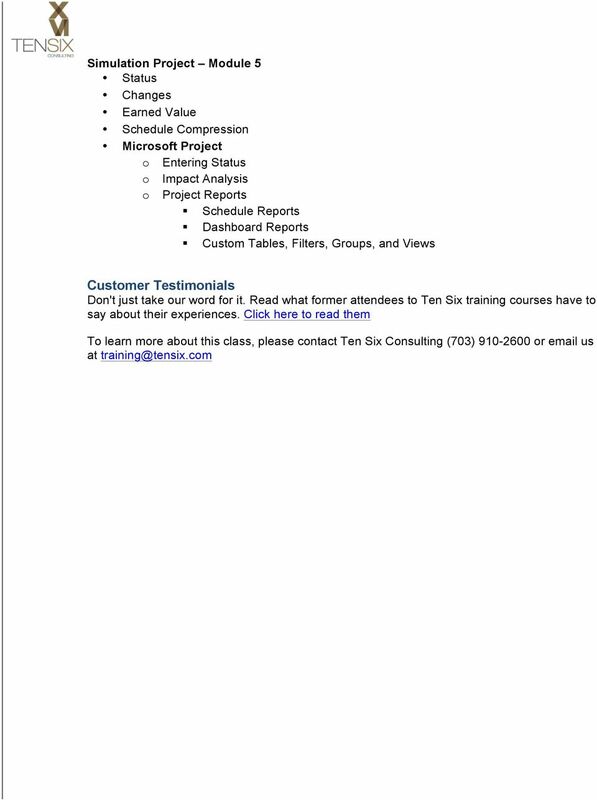 Create project reports and understand the audience for each. 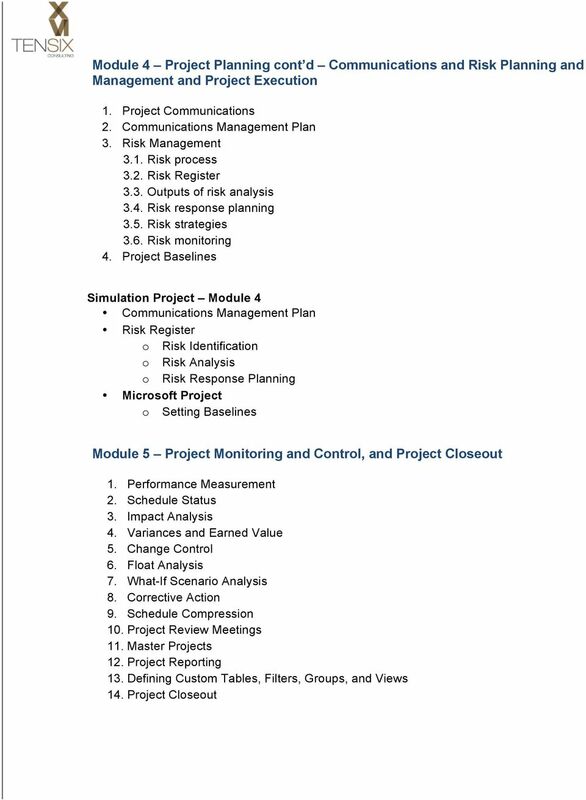 Identify the items required for closeout of the project, including capturing lessons learned.